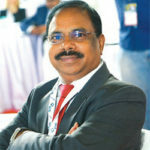 T Krishna Prasad, Secretary, DGP – Railways and Road Safety, Telangana State tells Vidyottama Sharma that integration of Public Transport is the most important issue in mobility. Replacing 20 cars with one bus, creating a BRTS system to carry passengers alighting from Metros and providing proper last mile connectivity are issues that need serious looking into, he says. A subject that has been very close to your heart is Public Transport vs Personal Transport. Do you really think that personal transport will gradually fade away? If you look at the demographics and rural vs urban divide in India, it is clear that India is migrating more towards urban towns and cities. It is estimated that one-third of the population is already in the towns. We have the same old cities and same old streets but the population gets added twice, four times, eight times. So, the challenges are: how do you make these people move within the same carriageway? The solution is very simple and straight – it is the Public Transport. We have choked our cities already with personal vehicles. We cannot go on like this forever. We need to do more on a policy basis. We have to think how do we now get more people on to the public transport and keep our roads cleaner and environment friendly, have a carbon credit for ourselves, and basically give a healthy travel experience for the people? Imagine Mumbai City without the Railway line. What will happen? Are the roads in Mumbai enough to take the entire traffic? No. Now let me add one more parameter for the Mumbai Transport system. Given the beautifully functioning local train system in Mumbai, what if we give BRTS perpendicular to the Railway line so that each time the train stops, each time thousand people walk out of the station, they are taken away to their workplace or their home? It will be beautifully and seamlessly done. Then the personal vehicles present at each railway station will reduce. That is the kind of solution each city should think about, and each local administration should talk about. Integrating the public transport from Metro to the BRTS to the intermediate transport systems like taxis, autos, aggregators, and the last mile connectivity needs to be seriously looked into. It is possible provided we do a policy thinking. The challenge is land acquistion. Mumbai does not have any land. I think this is a myth. Let me remove it straight away. There is a general feeling that a BRTS requires another lane. It does not. 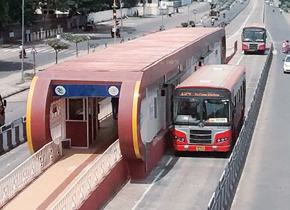 One lane from the three or four available lanes can be dedicated for the BRTS bus. Let’s look at the psychology of the bus. It is a huge body with a big engine because of which it picks up speed after a few seconds. When it picks up speed, it cannot be on the left hand side of the road and comes to the right hand side of the road. After some time, the bus driver needs to move back to the left side of the road to stop at a bus stop. So, for a 30 or 40km journey, for every half kilometer the bus keeps going left and right. And each time it moves from inside to outside and outside to inside, it stops the entire traffic behind it. If this bus gets one dedicated lane, all this will not happen. So all the other vehicles will have an easy access to the road, and easy flow of traffic will be ensured. Fundamentally, there is no need to add one more lane for the BRTS. Existing lanes are sufficient to dedicate one lane for the BRTS. Also, the passengers will not have to cross the roads. So their safety is ensured too. And since properties will be developed along the bus stations, commercial activity will take place. That is, the property owned by the bus operators or by the local administration is going to get leveraged, which will, in turn subsidise the BRTS Project. Therefore, the ticket size per passenger per kilometer comes down. If you look at the positives of BRTS travel: it is a healthy travel, it is an air conditioned bus, it has low floor (passengers do not have to climb five steps to enter), and it takes large volumes of commuters. That is the best part. You are doing away with 20 cars and having only one BRTS bus. Are you implementing BRTS in Telangana State? We are thinking about it. Right now we are on the Metro. We have to develop a system to evacuate the 200 to 300 people it will download at each stop as we cannot make them stand there. BRTS is a very good solution for that. Our Metro will be inaugurated in November by the Honourable Prime Minister. Despite saying for decades that Public Transport is the solution, we realise its quality in India leaves a lot to be desired. So, how will it become a solution? Basically the integration of Public Transport is the issue. You are spending hundreds of thousands of crores of rupees on doing a Metro. A Metro takes thousands of people in each car, and drops them suddenly at the destination. So the problem as mentioned above is: how do you evacuate those thousand people? So that integration called the multi modal transport, is something which is not looked into. So we are looking into only the part of the solution, not the complete solution. Metro on its own is not the solution. Metro, in combination, with the multi modal transport solutions, is the actual solution. Second thing: a commuter starts from home on a scooter and parks it somewhere. If you do not want him to come on a scooter or a two wheeler, you take a BRTS closer to his home, or an intermediate transport literally to his doorstep. If he is getting into two or three modes of transport to reach his workplace and back, look at the ticketing system. Can I have a single ticket and get into all these three different types of modes of transport? It is not the case today. So we need to think about that: Each time I do not have to stand in the line and buy the ticket. That single ticket system is another solution. Buying this ticket online, as a prepaid ticket, which I buy before starting from home, is the next layer. So these kind of solutions will give convenience to the passengers/ commuters. Ultimately, what succeeds in the transport sector is that solution which gives convenience to the commuter. You may give a great air conditioned bus but if it is not convenient to me, I will not get into it. Why are the aggregators successful today? Because there is a convenience factor there. So as policy makers it is our job to make travel seamless and more efficient. What steps are you taking on road safety? Any good regulations or awareness campaigns you are looking at? Like any other state in the country, Telangana State is also concerned about the number of deaths that take place in road accidents. In 2016, India lost 150,000 precious lives in road accidents. Telangana lost 7219 lives. Unfortunately, 50 percent of those people belonged to the age group of 15 to 35 years. The United Nations has estimated that the loss to the country because of these deaths in accidents is 3 percent of GDP. Now let me put this three percent of GDP in the right perspective. Total contribution of all the OEMs in the huge supply chain of auto industry to the GDP is only 7.2 per cent. While the industry adds 7.2 per cent to the GDP with so much difficulty and effort and investment (with millions of people working in factories and sales and other areas), the road accidents deduct 3 per cent from the GDP. That is the opportunity lost. It is so huge. It is a very serious problem that is challenging the country. In Telangana too we have similar figures. Out of 7219 people dying in road accidents in one year, 50 percent are in the age group of 15 years to 35. And who are these people? They are the bread earners. They work, earn money, have probably just got married, or have kids, and have aspirations & dreams for the kids. They want to send them to good schools, educate them well and see them have better facilities than what they have today. But unfortunately all these dreams are shattered when this person dies. “Total contribution of all the OEMs in the huge supply chain of auto industry to the GDP is only 7.2 per cent. While the industry adds 7.2 per cent to the GDP with so much difficulty and effort and investment (with millions of people working in factories and sales and other areas), the road accidents deduct 3 per cent from the GDP. That is the opportunity lost. It is so huge”. So if you put in the India perspective of 150,000 deaths, nearly 75,000 deaths are only in this age group which contributes to our demographic dividend. Now here is a dent in our demographic dividend that we are so proud of. We did a primary research to understand the causative factors. I normally put these factors as ‘three majors and three minors’. The three major causative factors are: Over speeding, Drunken Driving and Overloading (Overweight). These three contribute to more than 70 per cent of road accidents. The three minors are: Not wearing a helmet, talking on mobile phone while driving and not wearing a seat belt. These three majors and three minors put together account for 80 per cent of the total road accidents in the entire country, and Telangana is no different. Another parameter: 50 percent of the total deaths occur on the national highways and state highways alone. That is 22 percent of the total road length of the state (10 percent of national highways and 12 percent of state highways) which accounts for 47 per cent of the road accidents and 52 per cent of the deaths in road accidents. So we worked out a nice strategy of concentrating on the highways and our police force and the enforcement agencies are working against three things: Over speeding, drunken driving and overloading. We use a good number of laser speed guns to control the speed and challan the people who over speed. We are not happy with the number of laser speed guns we have and would like to have at least a 1000 guns more. We use the breath analysers to catch people who drink and drive, and the weigh bridges for overloading. All these are evidence based investigation and evidence based prosecution. When we produce computerized evidence in the court of law, we are able to get convictions. In drunken driving, we have arrested more than 5600 people in the last one year and we were able to send nearly 1000 people behind the bars. We are not trying to scare people, but are trying to bring a paradigm shift in the culture. We want it to become a habit that you should not drive fast, and that you should not drink and drive. Hyderabad City is one city in India, there could be others too, where when people go for a party, for a drink, they designate one among them as a driver, and have a nice party and come back home. We want to develop this kind of culture. We want people to be conscious of what is happening to their own families as their families wait for them when they go out. So we are creating this kind of awareness. How do you create this awareness? Every year, like the rest of the country, in the week of January, we organise the Road Safety Week. But we do not do it for one week, we do it for three weeks — in January and February. Typically every year we observe 31st of January as an accident free day in the entire state. If you take the last three years’ average, 60 accidents take place in the state of Telangana, and 20 people die every day. This year on the accident free day, there were only 20 accidents and three deaths. So that is the amount of drive we do. We do not leave even a single auto driver out of it. We involve every truck driver, every school kid and every college student. Everybody is involved. All government officers take part – right from the Chief Secretary to the Collector and to the Block Officer, and right from the DGP of the State to the constable. The awareness creation is huge. Industry and all the IT companies participate. As a result of this enforcement, coupled with the creating of awareness/ education, we have saved 541 human lives in the last one year (from Sept 12, 2016 to Sept 12, 2017). This is because of the twin policy of creating awareness and massive high level enforcement.